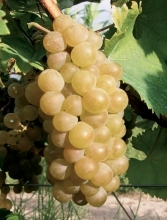 This variety was obtained in 1973 by INRA by crossbreeding Pinot gris G and Muscat Ottonel B. In France, Muscat cendré B is officially listed in the "Catalogue of vine varieties". - elliptical-shaped berries with a very slight muscaté flavor. Bud burst: 8 days after Chasselas. 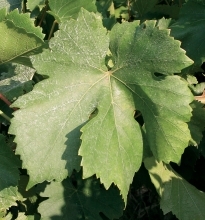 Grape maturity: period I, 1 week after Chasselas. Muscat cendré B has moderate to strong vigor and has horizontal growth. This variety is somewhat sensitive to coulure and to millerandage. Muscat cendré B is slightly sensitive to grey rot when overripe. The grape clusters and berries are moderate size. The sugar potential of this variety is moderate with moderate to weak acidity. Muscat cendré B can produce powerful, full-bodied and slightly aromatic wine. The only approved Muscat cendré B clone carries the number 1054.